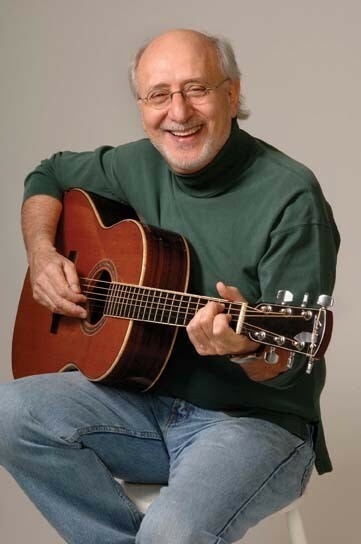 Peter Yarrow is best known as one third of the “folk supergroup” Peter, Paul, and Mary, whose numerous Top 40 hits include “If I Had a Hammer,” “Leaving on a Jet Plane,” and “I Dig Rock and Roll Music.” Yarrow wrote “Puff the Magic Dragon,” based on a poem by his friend Leonard Lipton. Harry Belafonte invited Peter, Paul, and Mary to the Selma-to-Montgomery civil rights march, and to the 1963 March on Washington, where Martin Luther King Jr. delivered the “I Have a Dream” speech. Yarrow went on to a solo career and a lifetime of activism, beginning with the anti-Vietnam War movement, including environmental causes and the defense of Soviet Jewry. In 2000, Yarrow founded Operation Respect, an organization that promotes cooperation and harmony in elementary schools. I spoke to Yarrow soon after he had organized the memorial service for Mary Travers, his former singing partner, at Riverside Church in Manhattan. Oblong Books & Records is at 6422 Montgomery Street in Rhinebeck. “Day Is Done” effortlessly makes the transition from song to children’s book. How did you compose that tune? The song was originally written in `68, which was the height of the antiwar movement. In `69, I organized a march on Washington, for peace. I was the co-organizer with a friend of mine called Cora Weiss. We had a half a million people there. That was the first song I sang at the march, to open it. The event started the night before, with the “March Against Death.” There was a procession that went all night, where people put the names of the war dead in coffins, and the coffins were borne to the Pentagon. And the next day, we had the “Celebration of Life.” And I organized that part, putting together all the performers: John Denver, Pete Seeger, Mitch Miller, Earl Scruggs and Lester Flatt, the Cleveland Symphony Orchestra string quartet, the cast of “Hair”—where theater became reality! Mitch Miller, the strange goateed MC of the “Sing Along With Mitch” show, performed at an antiwar demonstration? Yes, he did. I wanted to make it very broad-based. I wanted to say, “It’s not just folksingers here!” So it was a very interesting admixture. And I started the celebration with “Day Is Done,” which was a hit at the time, and it was widely thought of as a peace song. Did you plan to become a folksinger? No, I went to the High School of Music and Art [in New York City] as an art student. Then I started out as a physics major at Cornell, and ended up with a degree in experimental psychology. But in the meantime, I sensed the world’s consciousness was going to grow, and I took a class, English 355-6, that was popularly called “Romp `N Stomp.” It was there that I realized how central folk music could be to that transformation. “Romp `N Stomp” was a music course? It was ballads, folklore, taught by the renowned professor Harold Thompson. Did you have formal musical training? Well, I studied the violin for a couple of years when I was very young. Watching Peter, Paul, and Mary on YouTube, I’m impressed how precise the harmonies are, how musically sophisticated the group is. Yes, but all our harmonies were “head arrangements.” That means we’d make them up ourselves rather than have them written for us. Were the harmonies difficult to work out? Extraordinarily so. Sometimes we would take over a week to work out an arrangement. Is it true that Bob Dylan was going to join Peter, Paul, and Mary, at one point? Who knows? People have written that “Puff” is about drugs! They can write whatever they want—and they do! But the character Little Jackie Paper seems to refer to rolling papers, and sealing wax is supposedly a drug reference. I would call the assertion that sealing wax is related to the paraphernalia of junkies—I’d call that sloppy research. Did Peter, Paul, and Mary always have a bass player? The same bass player always? No. In the very beginning, we had Eddie DeHaas. Then [manager] Albert Grossman said we needed someone in the studio who would be like a fourth voice. So the person we used was Bill Lee, who was Spike Lee’s father. Listening to Peter, Paul, and Mary, I’ve started to feel that your harmonies become a metaphor for human cooperation. You’ve stumbled onto something that’s fundamental to my life. Other vocal groups look straight out at the audience; Peter, Paul and Mary looked at each other, and always did. We became the model of the way people could be: totally open, virtually naked before each other. And we celebrated that. You didn’t see that intensity of closeness in other groups.